My husband and I just returned from The Sea Ranch, where we went to celebrate our tenth wedding anniversary for four nights. We did not have internet access while we were there, or cellphones (yeah! ), so it was a very low tech long weekend. But I did take my computer and wrote and stored some blog entries. 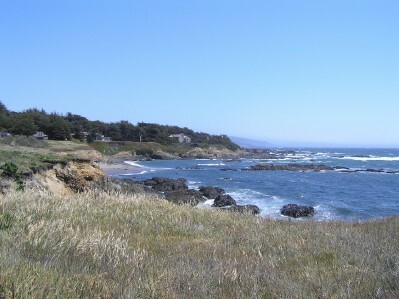 Here is the first . . . .
My husband and I have been coming to The Sea Ranch once or twice a year since we were married. Maybe even before. We have come alone, with the boys, with other members of our families and with friends. Everyone loves it – even the teenagers. It is just a magical place where the elements seem to be intensified in the blue of the water, the clarity of the air, the fecundity of the earth and the fire of the setting sun. Every time we come here, I experience some sort of spiritual jumpstart. I have always found my deepest connection to the divine while looking at the ocean. Don’t know why, just do. Maybe because it seems the beauty and power and, most of all, the mystery of the ocean most clearly represents God to me. I only know that when I am at the ocean, I unfailingly feel the impulse to pray. It is no different on this trip. We are staying at The Garden House, a small house we have rented a couple of times before. For one thing, it is a house that welcomes dogs, and Bella has come with us on this trip. It isn’t the most modern house, it isn’t the most luxurious house, but we find it a most comfortable and welcoming house. 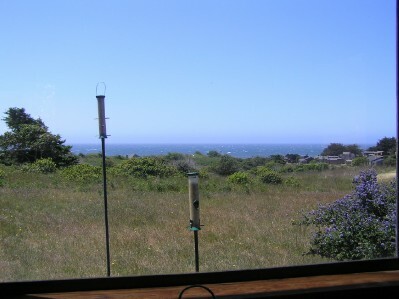 It has the most wonderful wall of windows overlooking the meadow and the ocean, and it is here that I sit right now, early Sunday morning, with my prayer beads. Let me tell you what I see as I look out this window. There are two bird feeders on posts just outside the window, and a couple of blue birds come to eat there every ten minutes or so. I call them “pig birds” for their enormous appetites. They are the size of jays, with the color of the sky on their backs and the white of the clouds on their breasts. When they are not on the feeder, they flick around under a hedge that runs to the left of the window at a right angle. 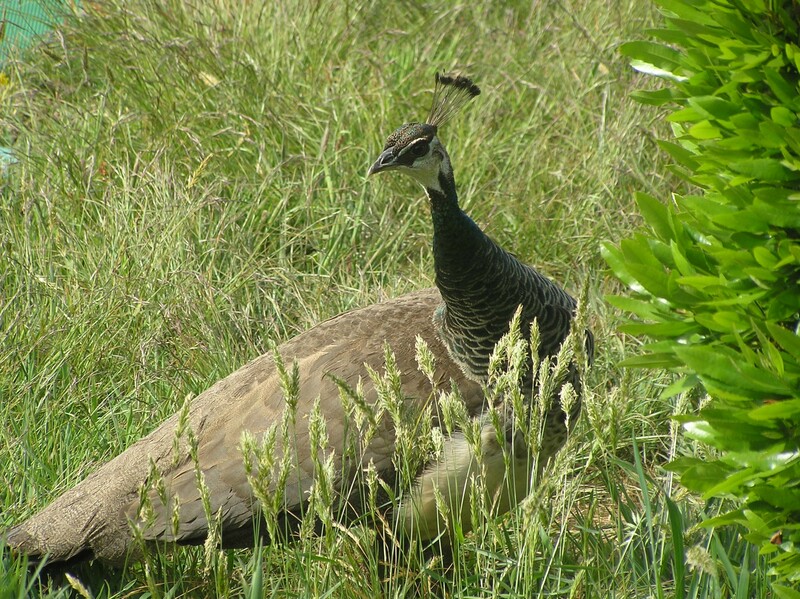 Sometimes they are joined by a pair of partridges or a pair of small yellow and black birds, and on two days we were visited by a large pheasant with a bold turquoise and green neck. Beyond the birds and the feeders there are green and brown wild grasses, dotted here and there with yellow and some small purple wildflowers. Beyond that is some green brush that runs down in a slope to the Pacific Ocean about one-quarter of a mile away. The ocean has been alternately gray and calm when the fog has rolled in, or blue with white wave caps when it has been sunny and the wind has joined us. Today is it sunny and the blue and white of the ocean and the green of the meadow are brilliant and cheerful. A row of houses – all of weathered wood – run down to the ocean in my line of vision on the right. Sitting in this window is my favorite thing to do in this house. It is one of the places I like best to pray in the whole world. I sit in the window seat with my back to the room and my face to the sea and I let my prayer beads slip through the fingers of my right hand one by one. I keep my eyes open, letting them fall on the birds that drop by, the waves of grass moved by the wind, the white caps on the ocean moving ever from the right to the left, from north to south. Looking at the ocean, I cannot help but feel the presence of God. My breathing soon becomes as regular as the waves, and my consciousness of my connection to the all that is and was becomes as deep as the blue of the sky. In this state, it hardly matters what I pray, only that I pray. Sometimes, I start with something more formal – meaning I have not memorized it but refer to it in my prayer bead journal, where I write down prayers I like. This week, I have been inspired by all the natural beauty around me to pray with St. Francis of Assisi, and chose a section of his Canticle to Brother Sun, which I adapted to the Anglican rosary in Bead One, Pray Too (page 80-81). My eyes on the ocean, I repeat, “Be praised, My Lord, through Sister Water; she is very useful, and humble, and precious, and pure.” My eyes on the meadow or the sky, I say, “Be praised, my Lord, through Brothers Wind and Air, and clouds and storms, and all the weather, through which you give your creatures sustenance.” Other times, I begin with something simpler, something memorized, like, “God with me lying down, God with me rising up, God with me in each ray of light,” from the Carmina Gadelica (Bead One, Pray Too page 96). But it isn’t long before I slip into something more rhythmic, drawn by the constancy of the ocean and the awareness of my own breath. Then I pray The Jesus Prayer: “Lord, Jesus Christ, have mercy on me. Lord, Jesus Christ, have mercy on me.” And later I will change the prayer to the most basic of all, the Hindu “Ham Sa.” “I am THAT. I am THAT. I am THAT.” I lose track of time, I lose track of myself, I lose track of everything but the glory of creation and my own breath that ties me to it. I do this every day we are here. When I am done praying, I will rise and take a shower and make some breakfast. Then I’ll sit back in the window – or perhaps on the small deck in the back yard – and wait for my husband to wake up. We’ll hike along the beach and maybe up in the hills. Then home to dinner and wine and it all starts again tomorrow. Our rhythms here are as a regular as the ocean, set by the regular slip of my prayer beads through my fingers each morning.